Life can be way too chaotic: From your hectic job to your demanding kids. Then add guilt over not going to the gym and the never-ending to-dos on your list – and you’re exhausted. You can’t wait to get home and fall face-first on your couch and stay there until morning. If you are tired all the time, the team at South Louisiana Medical Associates says you may just be so busy that you are wearing yourself out. Try taking a breather and see if that’s all it takes to make you feel like a new person; however, there could be a medical reason if you are tired all the time. Give yourself about two to three weeks to make some lifestyle changes, advises Prevention magazine. 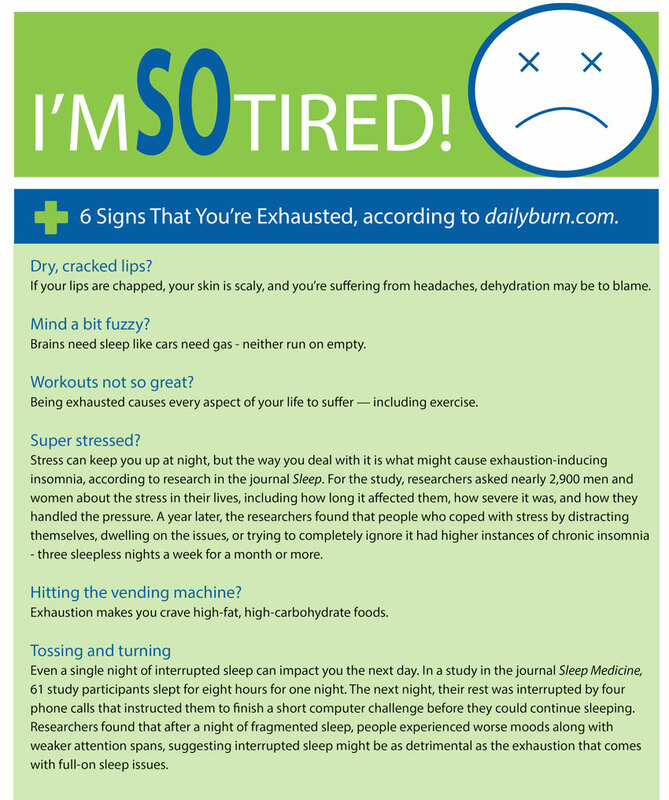 If you feel tired all the time, don’t blow it off, says Sandra Adamson Fryhofer, MD, an internal medicine doctor in Atlanta. Fryhofer told Prevention that excess exhaustion could be a sign of a more serious medical condition that can be treated. 1. Anemia: The fatigue caused by anemia is the result of a lack of red blood cells, which bring oxygen from your lungs to your tissues and cells. You may feel weak and short of breath. Anemia may be caused by an iron or vitamin deficiency, blood loss, internal bleeding or a chronic disease. Women of childbearing age are especially susceptible to iron-deficiency anemia. 2. Thyroid disease: When your thyroid hormones are out of whack, even everyday activities will wipe you out. The thyroid gland produces hormones that control your metabolism. Too much thyroid hormone (hyperthyroidism), and metabolism speeds up. Too little (hypothyroidism), and metabolism slows down. 3. Diabetes: More than a million people are diagnosed with type 2 diabetes every year, but many more may not even know they have it. Sugar or glucose is the fuel that keeps your body going. For people with type 2 diabetes who can’t use glucose properly, that’s a problem. Without enough energy to keep the body running smoothly, people with diabetes often notice fatigue, says Christopher D. Saudek, MD, professor of medicine and program director for the General Clinical Research Center at the Johns Hopkins University School of Medicine. 4. Depression: Depression is a major illness that affects the way we sleep, eat and feel. Without treatment, the symptoms of depression may last for weeks, months or even years. Common symptoms include decreased energy, changes in sleeping and eating patterns, problems with memory and concentration and feelings of hopelessness, worthlessnes, and negativity. 5. Rheumatoid arthritis: An autoimmune disease, RA happens when your immune system turns against itself and attacks healthy joint tissue. RA can sometimes result in irreversible damage to bone and cartilage. Many symptoms – including fatigue, low energy, loss of appetite and joint pain – are shared by other health conditions such as fibromyalgia and lupus. 6. Chronic fatigue: This condition causes a strong fatigue that comes on quickly. People who suffer from chronic fatigue syndrome feel too tired to carry on with normal activities and are easily exhausted with little exertion. Other signs include headache, muscle and joint pain, weakness, tender lymph nodes and an inability to concentrate. Chronic fatigue syndrome remains puzzling, because it has no known cause, according to Prevention. 7. Sleep Apnea: A sleep-disrupting problem that causes you to wake up feeling tired no matter how much rest you think you got. Sleep apnea is a disorder characterized by brief interruptions of breathing during sleep.